The Kia World Extreme Games isn’t just a collection of world extreme sports stars pitting their wits against each other in their chosen arena; it’s a worldwide gathering, drawing together people from all walks of life, from all corners of the globe. It’s also an opportunity to show a different side of the games to the world, a side that understands our changing world and the need to look after our planet. Just prior to the games, an incredible sculpture called ‘Win-Wings’, has been debuted to the world at the Shanghai Fashion Week, and will now be given pride of place on display at the Kia World Extreme Games throughout the competition. The nature of this sculpture? 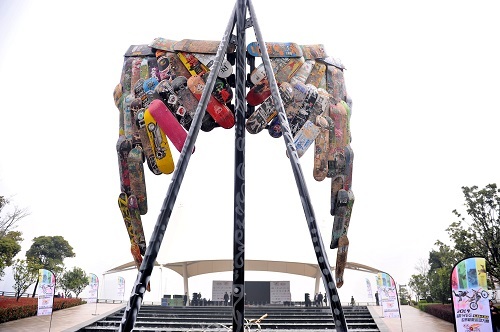 It has been created from 100 recycled skateboards, and is an incredible blend of sport, fashion and art. It’s a fabulous centrepiece for the games, displaying style, evolution, artistry and sporting endeavour. One of the great off shoots of this wonderful sculpture is that it has brought to the games another fabulous artist. The wonderfully named Quail Egg is a well known and highly regarded artist, graphic designer and illustrator in her native Shanghai. Her part to play in the Kia World Extreme Games is to design a limited edition official games skateboard, to be given to all those who donated their old boards to the ‘Reskate’ programme which were put forward to create the ‘Win-Wings’ sculpture. This is a fantastic artistic gesture, so we were naturally excited to have the opportunity to talk to Quail Egg herself about her thoughts on the games, her board, and the wonderful ‘Win-Wings’ sculpture that made all of this possible for her. When we caught up with Quail, one of the overriding emotions that came from her was her joy of and love for nature, “I always love things that are natural, beautiful and make me happy.” This is a theme that runs through her design of the soon to be launched Kia World Extreme Games skateboard she has inked. Quail Egg describes the theme of the design as being born out of an understanding and admiration of the solitude required from the many people who dedicate their time to the art of skateboarding. There’s a realisation that it can be a lonely sport, but that loneliness is sometimes actually more of an inner personal connection, an alignment of the body and mind for the skater. Quail Egg describes the average skater as being lonely but shiny! The shiny part refers to the soul, which recognises the pain of every fall, but also the necessity of that fall. Clearly there’s a happy solitude to hours spent practicing and practicing to become the best at your sport, and Quail Egg has used this as her inspiration behind her design. Although there are obvious challenges when it comes to illustrating a skateboard, Quail Egg informed us that, as long as you are careful when designing near the wheels, it’s not that far removed from painting on canvas! Thankfully she has experience of skateboard illustration in the past from which to draw! No doubt the ‘Win-wings’ sculpture will also have provided her with much inspiration, and she mentions what a cool concept it is! It’s great to see local artists being involved in the games. These global gatherings should always be about more than just the sport, and it really does appear that the Kia World Extreme Games is becoming a serious world event involving more than the just famous sporting figures that will eventually walk away with the Kia World Extreme Games medals! This entry was posted in Land Sports, News, Skateboarding and tagged Kia World Extreme Games, Quail Egg, Skateboard Designer, Skateboarding, Skateboards. Bookmark the permalink.